Window Cleaning Company Houston will clean your home or offices making it stand out with quality service. We value our customers and promise to give you the highest quality of service in window cleaning. 100% satisfaction guaranteed. We are committed to excellent service letting you take care of what is truly important to you and your family Service with a smile is the best way we can ensure you are happy and that we are doing our job. Attention to detail is our middle name, leaving no stone unturned. No other way we want you to feel than to know you can trust the Residential Window Cleaners Houston in your area with your valuables. We can provide you with an “outside only” window cleaning but we are sure that you may want more to clean. This puts us in a class by ourselves. When you choose Window Cleaning Company Houston then all of your worries will just melt away. Even when it comes to those hard to reach spots we will take care of that too. We can also clean chandeliers, ceiling fans, tall glass, skylights. We provide timely, reliable service that really cares to satisfy our customers and the homeowners. Taking pride in what we do for you. Give us a call and choose a Residential Window Cleaners Houston called Window Cleaning Company Houston. Window cleaning service for a commercial, or residential. If you own a home then you know cleaning windows can be a pain. Very time consuming job, involves climbing a ladder. Nothing will take the place of having a Residential Window Cleaners Houston professional take care of your window cleaning needs and will leave you with less worry to the day and without the hassle of falling off a ladder. This is an easy job to do for the professionals and your choice will be a good one if you use our service. So sit back and take your shoes off and set a spell. You do what you do while we do what we do best like keeping and maintain nice clean windows. Removal of all the screens. Wash and clean the screens upon request. 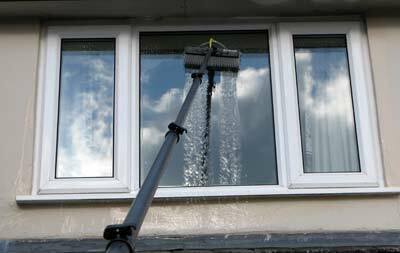 We clean the outside windows with squeegee or water fed pole system. If you have paint then we will remove it along with dead bugs. Towel dry areas if necessary on the windows. Wipe and clean the sills. Wear shoe covers and will work inside. What we did outside by washing or cleaning your outside we will do the same for the inside except with a squeegee and brush. To conclude we do a walk around the home or building as a final check up to make sure you are happy and satisfied. Some window cleaning companies when it comes to window cleaning will do so, on a monthly basis or every quarter or 6 months to a year. If you live in Houston this must be done quite often and sometimes regularly. At Window Cleaning Company Houston we love hearing from our customers and welcome any reviews you have for our business. You want to choose a company that has expert skilled knowledge of this process of cleaning your windows and taking care of your home or office. We have all the necessary tools and equipment to do the job right and on a regularly scheduled time. Here are few benefits. If the location is clean and the surrounding areas are the same then this will provide for a positive environment in your workplace and home. People who work on the job or who are in an environment like this tend to be happier with clean windows. They do a better job and perform at a higher level. You will want to put them in a safe clean place so that they feel comfortable. For example, anyone who may health problems such as asthma and allergies may get sick with dust on the windows. In your home or office everyone wants and needs to feel safe and assured that you are taking care of their needs and when they look out the windows nothing says I care like clean sparkling windows. A dirty environment breeds negative people and this will affect everyone involved. We can help and by using a Residential Window Cleaners Houston we fill that need. Window Cleaning Company Houston knows how to get the work flow going in an office or home. But it will be difficult if others had to work in a dirty environment. Try getting on a ladder reaching as high up as a 3 story building. Safety is a must with our company and all of our workers are taught and trained to take no risks what so ever. They are taught that each day comes safety. We avoid any accidents such as breaking the glass or preventing falls. Anyone else that you get to clean your windows will not always have this knowledge and skill to make safety a concern. They say that looks don’t matter it’s what count on the inside and we say otherwise. It matters to you and it for sure matters to our company. These are the first things people generally look at is your windows. So by all means get them cleaned and maintained by using Window Cleaning Company Houston. Clean windows tell others that you are clean and neat and you would prefer it that way. Others tend to treat you with more respect and dignity. Poor image sloppy business or sloppy home. Clean windows shows that you demand the best from those around you. You want to leave a lasting impression for the good to all who look at your windows. Don’t wait to use a Residential Window Cleaners Houston for all your window cleaning needs by call us at 832-639-3434.